We loved Henry Selick's stop-motion adaptation of Neil Gaiman's creepy Coraline, and now the Nightmare Before Christmas director is taking on a second Gaiman tale, with a Disney-backed version of The Graveyard Book. Yesterday, Disney revealed that it had snapped up rights to The Graveyard Book, Gaiman's play on Rudyard Kipling's The Jungle Book. 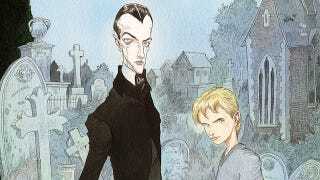 Where Kipling's hero Mowgli was raised by wolves in the jungle, Gaiman's, Nobody "Bod" Owens is raised by ghosts (among other things) in a graveyard, where he encounters all manner of strange and scary creatures. Today, we learn that Disney has attached Selick — who has been doing some mysterious work with Pixar — to direct. Hopefully, he'll bring the same chid-like terrors and delights he brought to Coraline. At the very least, we'll likely get some gorgeous stop-motion in the bargain.